Anchor – Young boys and girls who have their flair for anchoring the shows. Zee Keralam SD and HD Scheduled to launch on 26th November 2018, we have updated about serials and other shows of the channel. If you are interested to anchor television channel shows, here is your chance to apply for the same. 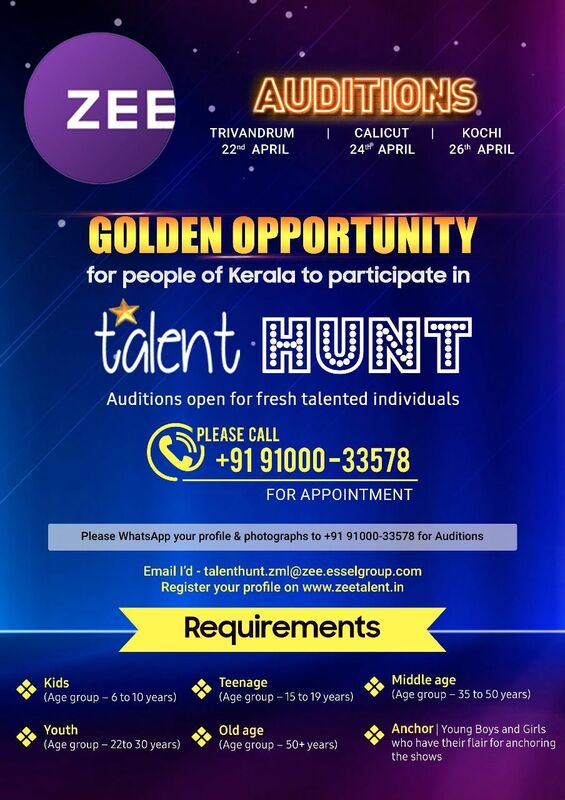 we have posted here about casting call for zee malayalam channel serial. this time it’s for anchor’s , reality show participants etc. zee tv is planning to launch their malayalam general entertainment channel, it’s scheduled to launch during 2018 onam season. now they are purchasing films rights, producing tv serials, reality shows etc. we can expect a grand launch ceremony very soon, we will update about the same here. can you give a stage for me anchoring for a show.